If you love to run or walk, you have come to the right place as Hendricks County is teeming with events in July that will help you maintain that active lifestyle, help some worthy causes, meet great people and see parts of the area you potentially haven&apos;t seen before. You can even kick off your Independence Day celebration with a run/walk event as both Avon and Danville will host morning events on July 4. Participating in these family-friendly events is a fun and healthy way to start your summer holiday festivities. Here is the "run" down of pertinent information. Danville will host the 10th Annual Blanton Woods 5K and 1 Mile Kid&apos;s Fun Run. The starting line for both events is located at the Danville Athletic Club, 49 N. Wayne St. The 5K begins at 9 a.m., and the course runs through scenic Blanton Woods with a mix of asphalt, grass, dirt, and sand paths. The 1-mile kid&apos;s run begins at 8:30 a.m. and consists of 2 loops through Ellis Park. It&apos;s free for the kids, and parents can participate with them. Register here. The Run 4 Freedom takes place in Avon at the ever-popular Avon Town Hall Park, 6570 E. U.S. 36. The timed, 4-mile run and 1-mile run/walk both begin at 8 a.m. Click here to register. Unable to attend these events? Not to worry, I have plenty more. This event is in memory of Peggy Best and supports Melanoma research. Register here. Start times: 8 a.m. for both groups - Ages 6-9 (shorter distances) and ages 10-16. Proceeds benefit the Bret Neylon Paralysis Foundation. Register here. This event supports Ben Harmon, a 2016 graduate of Avon High School and distance runner, who was recently diagnosed with a rare bone cancer. Click here to register. 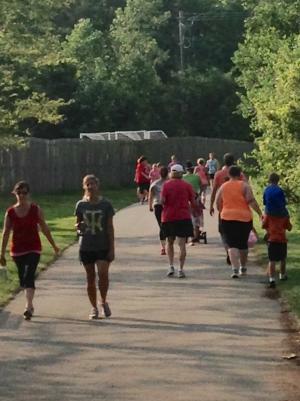 As you can see, plenty of fun, family-oriented running/walking options are offered this July! Have a wonderful Independence Day! Beth is a stay-at-home mom living in Pittsboro who works part time in the restaurant industry. In her spare time, she loves to run and started running races in spring of 2014. Beth completed her first half marathon in 2015 and plans on completing many more.